Can poverty be merely alleviated, as was the approach of an earlier era, or can it be totally eliminated? These is not merely an academic question but has very important consequences on how policy is framed by a government towards the path it chooses. Poverty alleviation, as history has shown, inevitably converts into a dole paradigm where the government looks upon itself as the sustenance provider to a large and important section of the population but has little or no further plans beyond that. Poverty elimination paradigm, on the other hand, is a completely different and transformative approach. So what is Poverty elimination paradigm? Consider the following. A loan being offered by a bank with no mention of collateral? Unheard of! However, today it is a reality for a person who is seeking a loan for a workable business idea but has no resources to give as collateral. The same surprise could be expressed when it comes to opening an account in a bank. There is no longer a need to be faced with a stern official reeling off a list of documents required, for opening an account, along with a referral from another who already has an account in the bank. Banking has now been rendered easily accessible to the poorest person in the country, should she desire it. Then there is the revolutionary implementation of Direct Benefits Transfer, now backed up by legislative power . DBT aims at eliminating the middleman and plugging the leaks that cause losses both to the source and the recipients of public money. It ensures quick transfer to the right beneficiary while eliminating middlemen and leakages. Subsidies from 59 schemes are now being transferred through Direct Benefit Transfers. Due to various reform initiatives under DBT, about Rs 36,500 crore has been saved by eliminating middlemen and bogus beneficiaries. PAHAL (Pratyaksh Hasthantarit Labh) the world’s largest Direct Benefit Transfer Scheme, is a shining example of this. The Mudra Yojna has lent wings to the aspirations of every citizen of this country. In a radical departure from traditional norms, it gives loans to small entrepreneurs without the need of collateral or guarantor. The Deen Dayal Upadhyaya Gram Jyoti Yojna (DDUGJY) has lit up the lives of thousands of people, hitherto submerged in darkness since Independence. The national drive, announced by the Prime Minister from the ramparts of Red Fort on 15th August 2015, aimed to connect 18,452 villages, un-electrified since Independence, in the next 1,000 days. 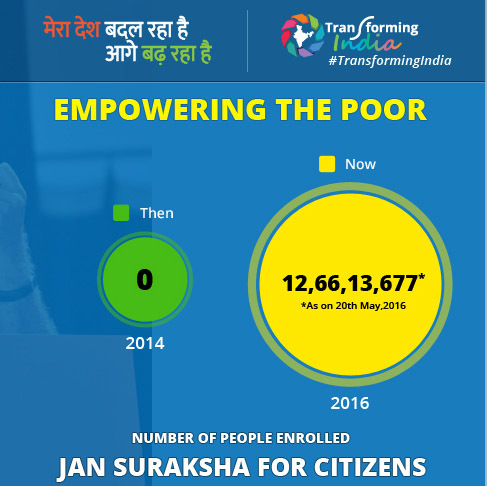 Since then, as on 28th May 2016, 7,930 villages have already been electrified. Skill Development Initiatives have been introduced to assist youth in charting a new course for their future lives. Skill training has been linked to Placement aiming to eliminate rural poverty. The Pradhan Mantri Kaushal Vikas Yojana has trained more than 19.65 lakh youth under various skill development courses. Several youth have been given loans to begin their own businesses. The Ujjwala Yojana is aimed at transforming the lives of women, their children and indeed their entire household, by providing them smoke-free lives. Five crore women from BPL families would be provided with LPG connections. It is the undying dream of every human being to have a home he could call his own. To this end, the Pradhan Mantri Awas Yojana aims to construct 2 crore houses for the Urban Poor by 2022. The connecting of every village with roads by 2019 through the Pradhan Mantri Gram Sadak Yojana (PMGSY) has been envisaged and planned to facilitate travel, trade and commerce in the remotest parts of the country. It is said, ‘Cleanliness is next to Godliness’! The people of India are only now beginning to realize this truth.Open Defecation has been a nemesis in most villages in India. The Swachh Bharat Abhiyan aims at putting an end to this scourge by constructing toilets in villages across the length and breadth of this country. Since the launch of the scheme there has been a gradual rise in the general awareness among the people towards maintaining cleanliness and helping towards achieving the aim of its government. In fact there has been a certain change in the very mind-set of the people. Creating a clean India would be such a perfect way to pay tribute to Mahatma Gandhi on his 150th birth anniversary in 2019. The ambitious intent of the Swachh Bharath Swachh Vidhyalaya to construct separate toilets for boys and girls in every school in the country has been realized. Through the Deen Dayal Upadhyay Antyodaya Yojna, the Government hopes to reach 8 to 9 crore rural poor households. To achieve this, first of all women from the rural poor will be organized into Self Help Groups. After enabling them to gain access to financial resources and improving their livelihoods, they will be guided and nurtured at every step to gain their entitlements until they stand strong on their own. A social security net has been formed in the form of the Pradhan Mantri Suraksha Bima Yojana which lends cover for accidental death risks and the Pradhan Mantri Jeevan Jyoti Bima Yojna which covers both natural and accidental deaths. The Atal Pension Yojana ensures minimum contribution and maximum benefits in old age. As is obvious, none of these schemes are designed to merely ensure a life of minimum sustenance for the poor. The aim is to empower them to become masters of their own destiny. They have been financially empowered to earn a good living of their own. They have been socially empowered to live a healthy and constructive life. They have been given a social net, both to cover exigencies during working age as well as to earn a pension when retired. They have been empowered by creating an enabling infrastructure, missing since independence, around them. They have been empowered with modern job-oriented skills. The underlying thread of each of these initiatives is the same – the government acting as a facilitator and opening of the doors of progress and opportunity for the poor to make them the driving force in the journey of Transforming India. Modi Govt. is only the sources of good leadership and to end the Crisis in Nepal ! BJP and Modi Govt. should give the attention to keep cordial relation in south Asia respecting the neighboring counties and their symbolic identities. In the context of Nepal, Nepal is the original land of Hinduism and Buddhism with the guardianship of monarchy. But, due to the Congress (I) and its RAW’s nefarious conspirator roles, who imposed secularism, republic and federalism and then Nepal is suffering. The main cause of crisis and anti-Indian feeling in Nepal was the Congress (I) Govt’s intervention. In that sense, Modi Govt. should have to suggest to the Nepalese leadership and Govt. to restore the Hindu kingdom and monarchy to keep cordial relation with India and China. Nepal and India lived life of unchallenged glory and power for thousands of years and spread its spiritual and cultural effulgence over vast areas of the globe-right. The Hindu thought did not stop at the negative aspect of restraining one religion from infringing upon another. The wide and all-comprehensive view of life ingrained in the Hindu ruler made him to respect and even encourage every single religious thought, however few its adherents, to grow according to its own genius. The Hindu King of Nepal had and has been becoming the symbol of support and protection to all faiths and creeds and never of negation of religion. In Maldives and Saudi Arabia, only Muslims can become citizens of that country. Even in Israel, except a few exceptions, only Jews can become its citizens. In Pakistan, a Hindu cannot vote for Muslim candidates. Out of the 199 countries around the world, more than 100 are non-secular countries and of them more than 100 are Muslim and Christian non-secular countries. Despite being aware of the fact it is intriguing that Nepal’s party leaders-Congress, UML and Maoist declared Nepal a secular state without the mandate of the people. Is it democratic sense? They directly hurt the feeling of the majority of the Hindus in the country and more than 1 billion Hindus all over the world. They forcefully the imposed the secularism minimizing the only one Hindu Kingdom and then there must be in existence the only one world Hindu Kingdom in Nepal with Hindu Crown (monarch). Nepalese monarchy is identified the most convincing identity of Nepal’s independence, cultural unity and safeguards the Indian culture and peace also. I think, majority Indian people also want Hindu Kingdom with monarchy in Nepal. We Nepalese people need to reinstate the amiable Hindu monarchy and Hindu Kingdom. The Nepalese monarch always has goodwill with India. The fact is that the Nepalese monarchs held special right for carrying out ritualistic worship in many Hindu shrines and temples in India and then India’s Hindutwa also can be dignified. So, Modi Govt. actively should propose to restore the constitutional monarchy and Hindu Kingdom in Nepal for the dignity of all Hindu in the world.